Can't wait for spring? 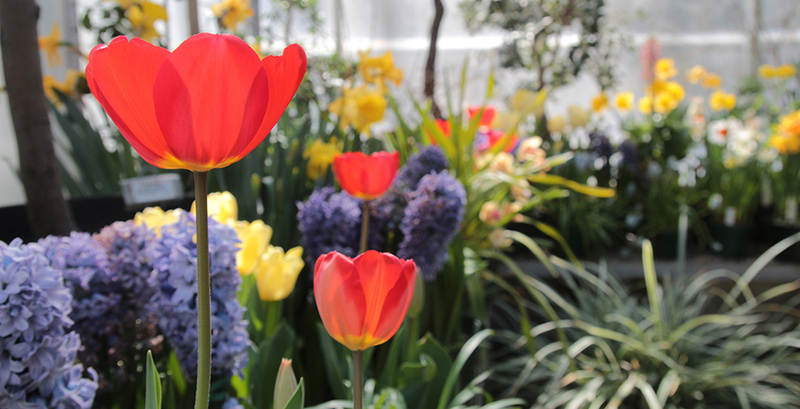 Head to Wellesley's greenhouses and get a preview of spring blooms. Spending time with the bright hues of tulips and daffodils, a whiff of hyacinth, and the intricate textures of cacti and spider lilies may be the perfect way to beat the polar vortex blues. The Ferguson Greenhouses are open every day of the week from 8 a.m. to 4 p.m. Admission is free. Kristina Jones, director of Wellesley College Botanic Gardens, says every year they are in a friendly competition with nature to see whose spring bulbs bloom first. This year it's a horticultural slam dunk for the greenhouses, which now contain blossoms we won't see for another six weeks or so outdoors. After being wowed by the spring flowers, check out the rest: There are 16 interconnected greenhouses comprising 7,200 square feet under glass. Many plants in the greenhouses have cultural value as food and spice around the world. Some plants in the greenhouses have historical significance to Wellesley College, the most prominent being the 130-plus year old Durant camellia which came from the founder of the college.